OLTS have built a reputation as a friendly professional company with an open approach to clients differing needs and requirements, resulting in a large percentage of repeat custom and personal recommendations. You can read more about what our clients say about us by clicking here. Oak Leaf Tree Services have over 20 years experience and are qualified to train and assess the skills required to do the job. All work is completed to the highest industry standards in a safe and efficient manner. Clients include both the public and private sector providing clients with a professional and committed service, from initial enquiry to the completion of the work. Oak Leaf Tree Services are an approved LANTRA training centre providing quality industry training in both professional and domestic sectors. Please contact us via out contact page if you would like to know more. Robert became involved with trees after qualifying in City and Guilds Amenity Horticulture. He worked for the Duke and Duchess of Devonshire at Chatsworth House In Derbyshire within the extensive estates and gardens. Robert then completed a 3 year National Diploma course at Merristwood College. On leaving Merristwood he worked in Europe as part of a team managing Berlin’s extensive tree cover. On returning to the UK he took a post with Surrey County Council where he helped set up and supervise a large team which managed Woking Borough’s urban and rural trees. 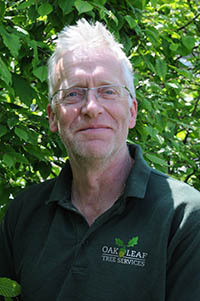 Robert then moved into a teaching role, joining the arboricultural department of the college at which he trained. During his time there he gained further knowledge of arboricultural training becoming an NPTC and LANTRA accredited assessor/instructor. Robert has been trained in Advanced Tree Climbing Techniques and Equipment Inspections having become a LOLER inspector (allowing inspection of equipment to comply with the Thorough Examination of Arboricultural Equipment requirements – LOLER 1998). Robert is continually attending industry updates and seminars to maintain and add to his professional portfolio. Originally from a farming background Hayley studied at Merristwood College and completed a 3 year Diploma in Countryside Management and Ecology. Hayley went on to work at a number of large educational outdoor centres which culminated in a post at Earth Trust Little Wittenham. 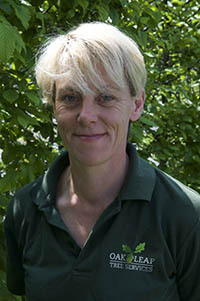 Her role there, as Schools Educational Link Officer, involved educating children about farming and food production. On leaving the Trust she took on the mantle of the day-to-day organisation of Oak Leaf Tree Services using her skills to liaise with clients, as well as managing the busy industry training company, Oak Leaf Training.